Six months ago, I was invited to open my gardens as part of Historic Weeds Week in Virginia. Imagine my surprise and delight. I have been quietly, patiently cultivating weeds for many years but never thought that my clover and crabgrass would equal the great weeds flourishing in the fields and gardens of the finest estates across the Old Dominion. Frankly, I was humbled by the invitation, which came from a Mrs. Dan D. Lyon of Somerset, Va.
Now this very special time has begun, and even as I write this, a few people in galoshes and yellow slickers are wending their way across my yard. Yes, it is a raw and rainy day, just the kind one hopes for during Historic Weeds Week. I have spent untold hours doing nothing to prepare: no tilling, no trimming, no pruning, no plucking. It took enormous restraint, but whenever I was tempted to gather up a handful of wild onion, henbit, and speedwell and fling everything over the back fence, I pulled out the gracious and complimentary letter from Mrs Lyon and read it yet again. Like this fine lady, I’m in it for the long game. Ah, now there is a real crowd gathering, and I will have to sign off and go greet my guests. As much as I cherish weeds, I have to say I didn’t realize so many shared my passion. My eyes are tearing up as I see affectionate couples marveling over the broadleaf plantain, ancient individuals exclaiming over the bittercress, apple-cheeked children stealing the dandelions, even a few merry teenagers peering down a groundhog hole. They are all smiling and chatting, and now the teenagers and old folks have started a just-for-fun mud fight, and the rain has slacked off and the cardinals are singing and there is nothing quite so beautiful as a garden full of weeds and the people who love them. On a country road not far from where I live, there’s a house I never notice except in the spring. Dozens of daffodils press against the front of this ragged little place. It looks abandoned, but the daffodils couldn’t care less. They are wildly happy the way daffodils always are, their gold faces drinking in the sun and sky. Who planted them, I wonder, and when? I dial back the years to 1950 or so and picture a young woman in calico with an apron full of bulbs. She kneels down in the light of a breezy September morning and gets to work. As her trowel pierces the red-clay earth, she thinks about her ailing mom or her husband’s upcoming birthday or a poem she would like to write if she can ever find time. She drops in the first bulb and keeps going down the row. “I’ll have these to look at in the spring,” she tells herself. She is sturdy and strong. A week after planting the bulbs, she learns she’s pregnant with her first child. The joy she feels flows out of her hands and hair and into the air around the little house. When the daffodils bloom, she is nearly eight months pregnant, big and round and eager to get on with things. Bending down to gather a bouquet, she laughs at herself when she nearly topples over. The bulbs will replicate over time. She and her husband will have four babies in seven years; three will survive. The name of the oldest, the one growing inside her while she planted those bulbs, will be etched on a shining wall in Washington, D.C. When the news of her son’s death arrives, the woman will be living far from the daffodils. She will be separated from her husband, angry at the world. It will be ages before she can laugh again. But the time comes when the tight petals of her heart slowly open. She takes night classes, has grandchildren, helps a fragile friend. The years drift by. One day a nurse at the doctor’s office comments on the beauty of her eyes and gives her hand a reassuring squeeze. She goes home, takes off her glasses, looks in the mirror: her eyes are as blue as the sky above Rapidan, Virginia. It’s been a long time since she thought of that place. Something comes to her–a flickering of light, a rush of gold. Wasn’t there a poem she always meant to write, a few things she really wanted to say? She had meant to say them all these years. The telephone rings: her granddaughter, on her way to take her to lunch. She smooths her hair and sits down to wait. Outside the high windows of her apartment, a hawk flies by. It is a clear, calm day. The kitchen clock ticks. She rummages around in her purse for the notepad she uses for her grocery list. The buzzer sounds just as she writes a single word, followed by a year. “It’s a beginning,” she thinks as she stands up and hurries to answer the door. As an audience member, I approach poetry readings with mingled feelings of hope and dread. These occasions can be truly marvelous or unspeakably awful. If a poetry reading has any hope of success, certain rules must be observed. The introduction must be brief and free of blather. The poet must be sober and mindful of the clock. The audience, too, must do its part: it should be unplugged, properly fed and caffeinated, and savvy enough not to clap after every darned poem. If a reading is awful, it is, of course, the poet’s fault. The poet has talked too long between poems, used the ridiculous, sing-song “poet voice,” or announced at the beginning, “You can hear me without the microphone, right?” The people in the back want to scream: Use it! Use it! Use it! It’s not there just to look pretty! But there’s always some knucklehead in the second row who nods obligingly, and the dumb-show begins. A good reading remains a tantalizing possibility. It’s sort of like birdwatching: when you see and hear an actual fire-veined poet in the flesh, your heart does backflips. You thank the stars you showed up. You are not blinking, and when you get home, you pace around for a while before you can settle down. Lucille Clifton, reading in her adopted hometown of Columbia, Md., in the early 2000s. Clifton, who died in 2010, was the rare poet who left audiences wanting more. On this occasion, she was on stage for no longer than 30 minutes, her half of a two-poet reading. Her poem based on the molestation she experienced as a young girl elicited gasps from the audience. It was not a slam poet’s self-indulgent shock poem; it was “moonchild,” a heartrending study in restraint, published in Blessing the Boats: New and Selected Poems, 1988-2000. When she closed with “won’t you celebrate with me,” she changed the pronouns so her signature poem about an individual woman’s survival against the odds became a communal celebration of endurance. I was not the only one who wept. Clifton had that much grace, that much power. Louise Glück, reading at the University of Virginia in 1980 or 1981. The packed auditorium fell into rapt silence as soon as Glück opened her mouth. Slim and elegant in a black dress, she read her poems, many from The House on Marshland, without a word of commentary. You didn’t have to be Helen Vendler to know this was a poet headed toward greatness. Glück, whose very cool umlauted name means “luck” in German, is a brilliant presence on stage. Gwendolyn Brooks, reading at the Cambridge (Mass.) Public Library, in the late 1990s. The reading took place in a cramped space with not enough folding chairs for all the people who wanted to hear the eighty-year-old poet and leading voice in the Black Arts Movement. Tall and commanding and wearing a colorful turban, Brooks read beneath the glaring light of a local community-access TV station. She read old poems and newer ones, some in sonnet form and some in free verse. With perspiration trickling down her face, she was as fully alive and present in the moment as anyone I’ve ever seen. She died in 2000. When I close my eyes, I can still hear the applause rocking the Cambridge library as she took her final bow. My summer travels brought me to the small town of Marion, tucked in the mountains of southwestern Virginia. My partner, Roberta, was doing genealogical research and we had some old family sites, the library, and a cemetery to visit. The town holds literary interest, because it was here that Sherwood Anderson, author of Winesburg, Ohio (1919), lived while working as a newspaper publisher and editor during his later years. But the evening we arrived, we were weary. Our only order of business before dinner was touring Main Street, not doing research of any kind. We emerged from the General Francis Marion Hotel and ventured across the street to a quirky looking shop called Appalachian Mountain Spirits. Although it was closing time, co-owner Scott Schumaker, a large man with a gentle demeanor, said we could look around while he took care of some paperwork. Roberta wandered off. I got no further than the cages of kittens near the front door. They were all up for adoption, and I was transfixed. 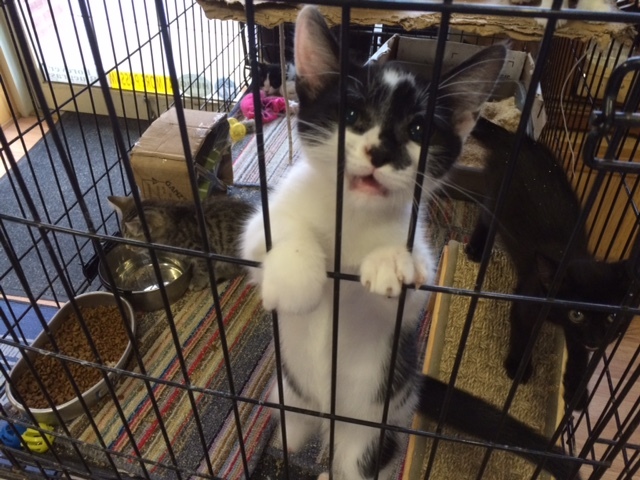 A couple of black and white kittens and a solid black one were vying for my attention. A beautiful gray cat lay fast asleep. In another cage, a tiny silver tabby tucked her chin into her chest and dozed. She was the one I had to hold, and Scott Schumaker obligingly unlatched the cage and placed her in my hands. I wanted to slip her in my pocket and take her with me everywhere. That was what I wanted but not what I did. The store was closing, and Roberta and I left, murmuring our goodbyes to Scott as we headed outside and down a couple of doors to a nice, down-home restaurant called the Wooden Pickle. Although Roberta and I had never been out of each other’s earshot during our visit to Appalachian Mountain Spirits, it turned out we’d had completely different experiences there. After learning what she had discovered while I was cooing over kittens, I resolved to return the next evening and conduct a mini-interview for this blog. HH: How long have you been here? Dana: Two and a half years. HH: What is the purpose of the store? Dana: We are a distillery with an ABC store and a whiskey tasting room, so we have locally made artisan wares in the front, the ABC store is in the middle, and our still is in the back. HH: Tell me about these cats up front. What’s going on with all the kittens? 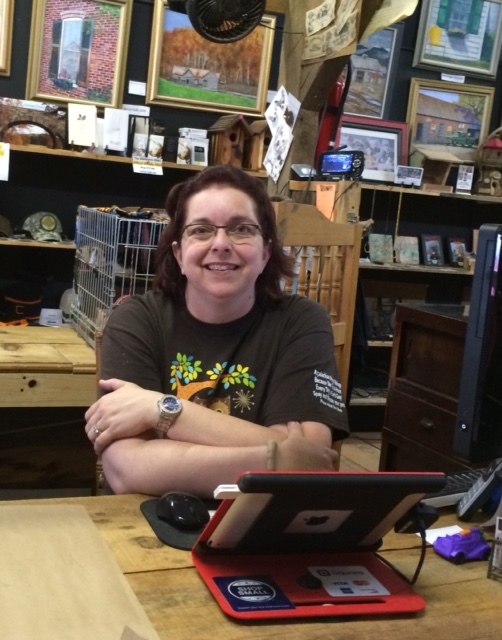 Dana: Well, I have been an animal rescuer for 20+ years. 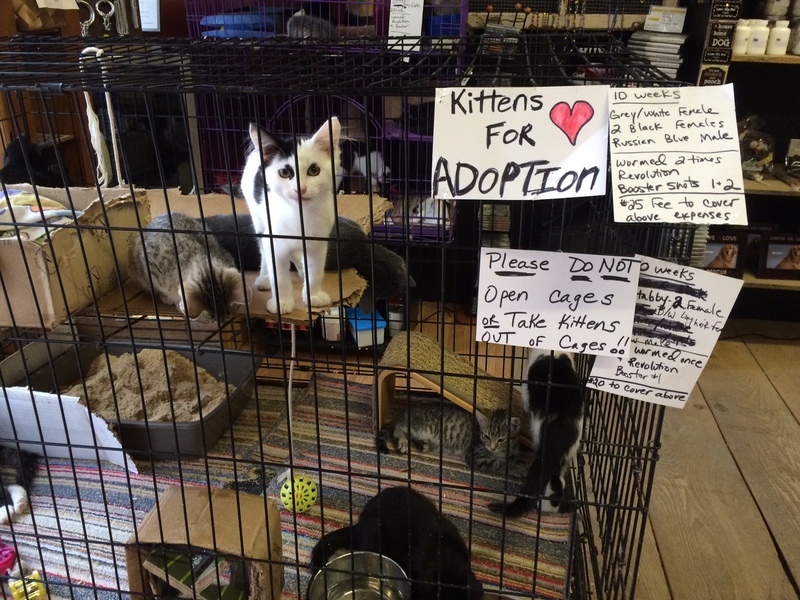 When we opened this store in Marion, I decided that I wanted to support the local shelter, since it is a very high-kill shelter, and I have [found homes for] kittens and adult cats since last September, and we are approaching about 300 adoptions. HH: Who’s adopting all these kittens and cats? Dana: A lot of locals. And believe it or not, I’ve actually had someone from as far away as Ohio adopt a cat, so even people who are traveling are getting them as well. HH: Do people come in for the whiskey and stay for the cats, or vice versa? Dana: It goes both ways. We have people come because they heard that I have cats and they end up going to the back and trying the whiskey. Some people come in for the whiskey and fall in love with the cats. HH: Where are you from? Dana: Originally from Orlando, Florida. HH: What drew you to the little town of Marion? Dana: The mountains. My husband and I knew that we wanted to move to the mountains, and we especially wanted to be close to the AT [Appalachian Trail]. We hadn’t decided where, and someone directed us to southwest Virginia, and we fell in love with Marion and moved here. HH: What was this building before it became your business? 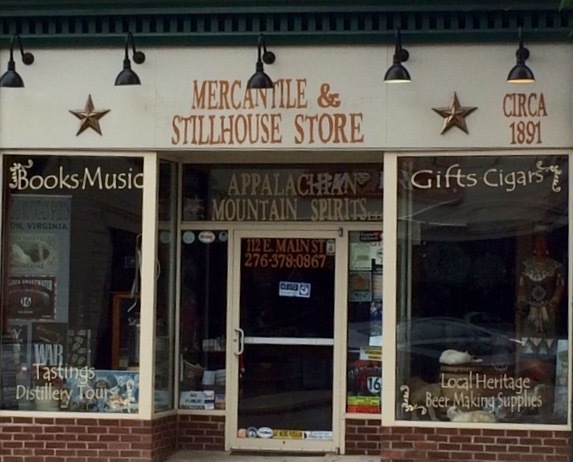 Appalachian Mountain Spirits, Marion, Va.
Dana: It was an Amish goods store and prior to that, I’ve been told, it was a bookstore, a photography studio, a jewelry store, and a Rose’s department store. HH: Wow, that’s lots of different things. Do you have plans for things you might add to what you sell here or other things you might do? Dana: We want to do something with the upstairs. We just haven’t decided what yet. We’ve thought about having a cigar bar or a private whiskey club. We don’t know. HH: But, plans in the works? After the interview, I went to the back of the store, past several shelves of moonshine and the whiskey tasting bar, in search of Roberta. 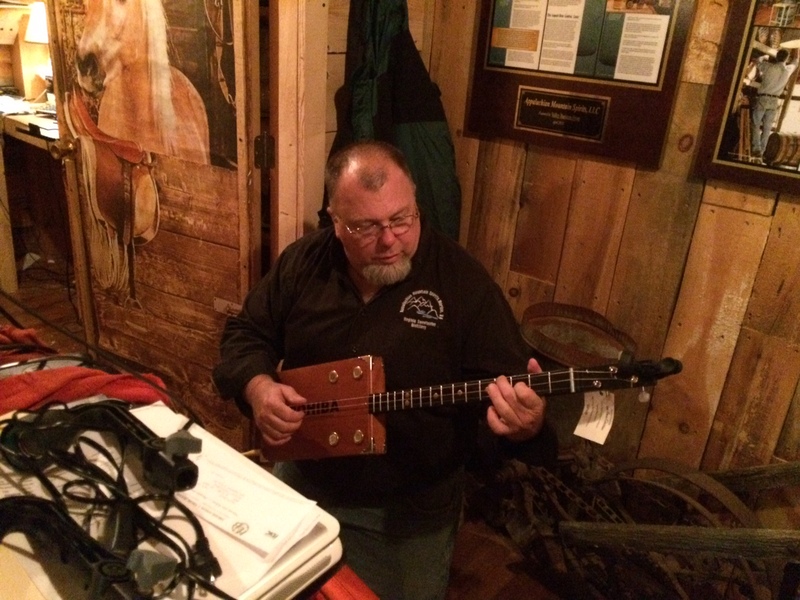 She was talking to Scott, who had hooked up a guitar made from a cigar box to an amplifier. It took a little doing, but he got it to work and the sound was lovely. Roberta bought that guitar. When she plays it, now that we’re back home in our corner of Virginia, I’m sure I’ll think about the Schumakers and the whiskey and the cats. I’ll think about the new kitten, a tall black and white one, that had arrived just an hour before our second visit to the shop. He’d been found behind an old factory where they used to make Buster Brown shoes. When Dana Schumaker let me hold him, he stood completely still in my arms. Hoping. Waiting. If I could’ve taken him home, I would’ve named him Sherwood and given him my whole front lawn. A kitten in Marion, Va. I don’t see myself as a runner. I don’t have the stretchy body that real runners have or a deep need to push myself off the cliff of my physical abilities. Nor do I have the long-distance runner’s gaze—that gaze that manages to be both direct and, well, distant. Real runners are in love with the miles they log, a fact they don’t try to hide. I’m not like that. And yet I’ve run ever since I was thirteen or fourteen. During the cosmic blip, otherwise known as my Pennsylvania girlhood, I used to run around the back roads of our little town. I would set out from the backyard, pass the treehouse and my basketball hoop, and take off. There was little traffic except for the occasional annoying truck. This was during the summertime, and I was pretty much alone with the clomp of my basketball shoes on the pavement and the scent of dandelions and other roadside weeds. When I reached an area that had the distinct feeling of nowhere, I turned around and went home. If I ran in a different direction, through the town and past the university, I would quickly come to the open spaces of Pennsylvania Dutch country. In my memory those fields are striped green and gold. The horse-drawn buggies with their orange triangles instead of license plates are clip-clopping up ahead. I’m in awe but getting nervous because I’ve left my world behind, close by though it is. If I kept running, would I end up in the arms of a bearded, behatted farmer, never to see my family or my school or my cats again? Time to turn back. I’ve run in every town I’ve lived in since then, in Virginia, North Carolina, Massachusetts, and now in Virginia again. I’ve run in the morning, at dusk, at midday, in boiling heat and sudden downpours. Every once in a while, I’ve run with a friend by my side and that has always been more fun. These days I usually run alongside strangers at the gym. About fifteen years ago, when I discovered I could run on a treadmill without falling off, I knew I had met a worthy adversary. The treadmill is wonderful and awful all at once. It is built to irk. I step up onto it, hit quick start, and set the speed to a brisk walking pace. After a few minutes, I increase the speed—beep, beep, beep, beep!—so I’m jogging but not experiencing any distress. By all rights, this is where I should stay. There’s nothing wrong with a steady pace that allows for normal thoughts. But I guess there’s a tiny masochist living in my hand, because I always reach out and increase the speed yet again. At first I’m exhilarated. My feet are pounding on the moving belt with the same thunder of my old Converse sneakers on the Pennsylvania pavement. Then things deteriorate. My breathing has a hitch in it, the drone of the machine is alarming, the length of time I’ve been running is not notable, and I’m pumping my arms and legs for dear life. I’m depressed and desperate, yet still I run. My own hand does not reach out to save me. Until it does. For my dear life matters more than clocking another half mile at what feels like an insane speed. I have nothing to prove: I’m on a treadmill in Culpeper, Va., not approaching Heartbreak Hill in Boston, and I’ve finished my race against myself. A rather short race at that. I drink some water and pace around the gym. I drive home, hungry and pleased with myself, knowing I will sleep well tonight. I’ll never run more than a few miles at a time. I’ll never have that long-distance runner’s look in my eye. Just thinking about a marathon, to say nothing of the countless hours of preparation, makes my knees ache. But as the Boston Marathon approaches, I must say, I admire those runners. What I see in the best of them is a singular dedication and resolve–the same thing I admire in poets like Denise Levertov and Adrienne Rich. 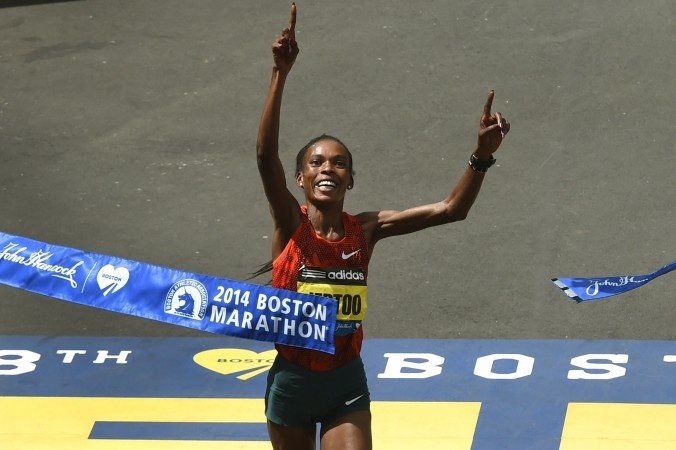 For their own reasons, great runners and great poets go beyond reason. They are beautiful and human, and this is what they do whether anyone is watching or not. But in person or on TV, we do get to watch the Boston Marathon. We can see those runners in their act of creation. And when they win, it is our good fortune to see the world’s most dazzling smiles. To get to the county dump, I take Mount Sharon Road. It’s a quiet country lane lined with farmland and mountain views. In the late afternoon, the light is fantastic. One fall day, I stopped my car right in the road, stuck my head out the window, and took pictures of shadows falling across green lawns and golden fields. There are a few steep rises so you have to be careful. More than once, my heart has leaped as another car barreled toward me taking up more than its share of the road. The perils of mortality are alive on Mount Sharon Road. After another couple of turns, I go down another road and arrive, at last, at the dump. Wire-mesh gates stand wide open. Great big bins await the garbage of the local citizenry. Other bins beckon to conscientious recyclers of plastic, newspaper, tin cans, and glass. There’s also a place to dispose of old batteries and another place where you can deposit used clothing that some other person might still want to wear. Sometimes, in a folding-chair far away, there sits a Man. If you have trouble with an extra-heavy bag, the Man will come and hoist the bag into the bin for you and talk a while. The Man is not the only one at the dump. Fifteen or sixteen cats live there. You have to drive slowly when you arrive so you won’t disturb these creatures, perched like little sentinels all around the entrance. I have been trying to get to know these cats. The first time, the Man came over to help me and talked about his own cats. He and his wife had way too many, and he finally took most of them to the animal shelter. He talked on and on about these long-ago cats. Keeping up my end of the conversation as best I could, I eyed the residents of the dump. Some stood still; others darted out from under and around the bins. I was mesmerized. The Man said someone comes by to feed them. Behind the recycling bins I glimpsed plastic plates laden with half-eaten food—the Man spoke the truth. Unable to contain myself any longer, I called out to a cat, and she came running up to me. She was longhaired and sweet and should have been somebody’s pet. I noted her lopped ear—the universal sign that a feral cat has been caught, neutered, and returned to its home turf. She let me pet her and then went wild when I tried to pick her up. On subsequent visits, I have lingered among the cats. The pretty, longhaired one seems to be gone; perhaps someone lured her into a cage and took her home. The others are not as friendly as she was. They let me get close but not close enough to touch them. I’ve been tracking a fluffy, mid-sized black cat that is ridiculously cute. I’ve noted several gray and tan ones. A couple of big muscular cats sidle back and forth as the young, leggy ones scuttle under the bins. Then it’s goodbye, and people go back to their cars and trucks and go home. They forget all about the cats until next time. I go home, too. On Mount Sharon Road, dusk is falling. I think about where we all end up: some of us in fine mansions, some in tidy little apartments, others in tents under bridges or walking stoned and bareheaded down a desolate road at one a.m. The cats, too: some snooze on satin pillows while others, well fed, live out their nights and days at the dump. Meanwhile, their unneutered cousin lunges for a field mouse deep in the woods. Still another decides to cross the street at just the wrong moment, and the car’s driver (who had studied, in his modern poetry class, Wallace Stevens’s “The Man on the Dump”) barely registers the light collision as a life abruptly ends. The next morning, a twenty-three-year-old will find the body and cry hard. She’ll cry again that night and still again on her way to work the next day. Years later, maybe she’ll cross paths with the driver of the car that killed her cat, at the supermarket or gas station or the county fair. Or maybe they’ll meet at the dump. And the man goes home and so does the woman, and the sun goes down on the cats at the dump. And a car glides past another car tonight and the next day and forever and ever on Mount Sharon Road. And love shimmers everywhere–everywhere!–in the still country air.